Detroit mayoral race: Mike Duggan is the frontrunner. 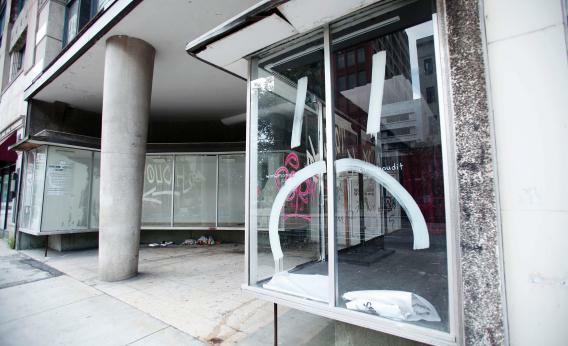 Windows of an abandoned office building in downtown Detroit is seen July 19, 2013 in Detroit, Michigan. An election for mayor of Detroit doesn’t mean what it used to. For the foreseeable future, while the city works through bankruptcy proceedings, it’s effectively run by emergency manager Kevyn Orr. But elections have to be held anyway, and yesterday voters set up a runoff between two top finishers: Wayne County Sheriff Benny Napoleon and ex-Detroit Medical Center CEO Mike Duggan. It wasn’t even close in the first round. Duggan, who wasn’t on the ballot, won maybe 15,000 votes more than Napoleon, without even appearing on the ballot. Duggan waged an unlikely write-in campaign and said observers are saying 97 percent of the write-in ballots were written correctly. With city election officials checking write-in ballots in all 614 precincts, “Mike Duggan“ had 44,395 votes. “Duggan” with no first name was the next most popular listing, followed by “Mike Duggen,” “Michael Duggan,” “Mike Duggon,” “M Duggan” and “Mike Duggin.” There was a ballot cast for “the white guy Mike Duggan.” Taken together, the ballots indicate many of the write-in votes were expected to eventually go for Duggan, the observers said. The white guy! Indeed, Duggan is white—he’s the first white candidate to lead the first round of a Detroit mayoral election since 1969, when Democrat Roman Gribbs won the office. That was before the peak of white flight. Today Detroit’s population is 83 percent African-American. Other cities with such high proportions of black voters, like Atlanta (54 percent) and Washington, D.C. (50 percent), have elected black mayors consistently since the Civil Rights era. The only major city with a black population that’s elected a white mayor? Baltimore, where three out of five residents are black, and where Martin O’Malley managed to win two elections.